The BIGH team is a combination of people from different backgrounds and sectors: innovative farmers in both agriculture & aquaculture, supported by a technical team for driving BIGH farms development. 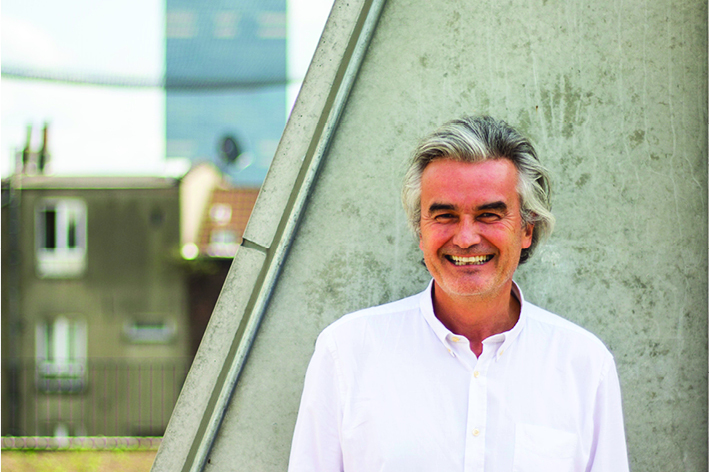 BIGH is led by the vision of the architect Steven Beckers, the founder. BIGH team members all share a passion for taking urban farming to the next level, as pioneers in Europe of profitable urban farming in a sustainable way. Steven Beckers is a visionary and a solution finder, who transforms companies’ real estate assets into opportunities. A Cradle-to-Cradle accredited architect, Steven has led major award winning architectural projects internationally and circular economy projects in the real estate sector since 2011, with his consultancy company Lateral Thinking Factory. Our fish manager Olivier has 20 years of experience in aquaculture. He is a fish and nature addict, as well as a first class technician and builder. Olivier thinks big, drives operations with playful ease, and innovates as a second nature. Our horticulture manager Denis Dumont brings his vast experience from organic farming and European seed companies to the team. He brings his determination and ambition to develop and operate the most innovative, sustainable and healthy farms possible. Our CEO Frank Goes drives the company forward to achieve BIGH’s ambitions and take the business to the next level. His 30 years of management experience brings efficiency and speed to BIGH’s development. Our financial director Thierry de la Barre makes links between operational details and the big financial picture of the company. He brings structure to the BIGH team by being a step-back from day-to-day operations, a corporate touch in a startup environment. Our technical manager Johan Cousin, experienced within the conventional building industry, oversees the building of greenhouses and building adaptation. He is patient, detail focused, and has excellent foresight to prevent problems materialising. The bio-engineering background of Mathias De Vos combined with his focus and organisation sees him speaking in the vocabulary of electricity, irrigation, production techniques, and aquaponics. He manages to deliver for BIGH in four languages; German, French, Dutch and English! Our smiling Flemish BIGH member joined recently, and immediately jumped into the fast-paced environment of BIGH. She is strengthening the commercial team by daily calling and accompanying our clients. Last but not least… her cooking skills were immediately discovered by the team! BIGH offers different internships. For students in high-school, Bachelors or Masters, these internships last from a few weeks up to a year with active participation in the farm’s different activities. These internships rely on a school or university’s agreement. For non-student candidates, internships are offered but are limited in number. Non-student internships are supervised by a “Convention d’Immersion Professionnelle” (CIP),this is an agreement from the Brussels Capital Region for placements between 1 and 6 months. BIGH is a diverse organisation and can provide interesting internships in horticulture, aquaculture, sales and marketing, and construction. BIGH focuses on sharing with other professionals through visits. Interested professionals can book a visit with one of the BIGH team experts (production, construction, new business). Professionals are free to ask questions and discuss specific technical aspects of BIGH with our experts. BIGH aims at developing a network of urban farms internationally in the coming years. We are always interested to hear from interested candidates, send us your CV and we will keep it on file. If you want to send us your CV, please use the button below.